FILE - A herd of desert elephants searches for water in the drought-stricken Gourma region of Mali. Poachers have killed more than 50 elephants in Mali this year, a large portion of the country's declining elephant population. In an attempt to protect the diminishing herd, 50 rangers are set to patrol a vast area in northern Mali, frequented not only by poachers, but also jihadists, armed militias and drug and arms traffickers. There are just 350 to 500 elephants left in Mali, and those that remain face threats not only from poachers, but also from armed groups, climate change and reduced rainfall. From January to June this year, 87 elephants were found dead, at least 57 of which were killed by poachers, said Mamadou Haidara of the national conservation and wildlife authority. 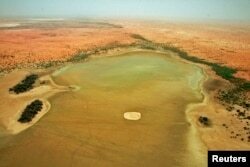 An aerial view of the dried up Lake Banzena in the drought-stricken Gourma region of Mali, May 24, 2009. According to the U.S.-based WILD Foundation conservancy, which helps protect Mali's northern Gourma herd, about 90 elephants have been killed since late 2014. The elephants' home is located in a part of Mali that is not under complete government control, and it is an area where al-Qaida and other extremist groups have been active. “As you know, Mali is in a situation where it’s very difficult to control this territory," said Haidara. "The armed groups and others take advantage of the insecurity to kill the elephants and sell the ivory." Following the occupation of northern Mali by Islamist extremists in 2012, many young men were lured by high salaries offered by al-Qaida while others took up arms. When the extremists lost power, young men found themselves without work, rejected by their communities and sometimes even unable to return to their villages. As Haidara tells it, some went into organized crime, such as poaching. To help save the elephants, 50 park rangers will deploy to the region, a 32,000-square kilometer savannah and semi-desert region. The rangers will be armed, though the weapons have yet to arrive. “Fifty men is far from enough, but at least it’s better than nothing,” Haidara said. No other elephant herd in Africa has developed a migratory pattern like the elephants in Mali, allowing them to survive in an environment with little water and sparse vegetation. Tens of thousands of elephants once roamed West Africa’s savannahs, though now poaching and climate change have drastically diminished their numbers.